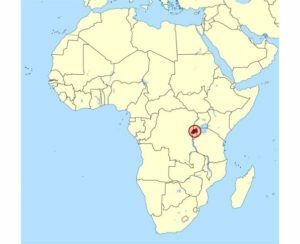 With 11.92 million people, Rwanda is the smallest country in East Africa (7). However, its investment in social welfare and healthcare placed Rwanda as one of the few African countries predicted to achieve the Millennium Development Goals in 2015 (2). Public healthcare services in Rwanda are organized in three levels: primary-level facilities, district hospitals, and national referral hospitals. However, many patients also choose to visit private health facilities and traditional practitioners (1). The most common causes of mortality in Rwanda are infectious diseases, such as malaria, respiratory infections, HIV/AIDS, etc. (3). Although universal healthcare coverage has reduced barriers to healthcare, the health system in Rwanda is severely understaffed, with only one hospital per district (70,000 to 480,000 people). And while 85% of the population lives within 1.5 hours walking distance from a primary health unit, these facilities rarely have trained medical personnel, such as physicians, nurses, or administrative personnel. The medically-trained staff in Rwanda are largely concentrated in the national or district level facilities (1). Unsurprisingly, a study on emergency general surgery procedures in Rwandan district hospitals noted that many people living in rural areas of Rwanda delay seeking care (5). This causes manageable conditions, such as bacterial infections, to progress into life-threatening emergencies. As a result, the most common surgical complications were soft tissue infections (71.6%) and acute abdominal conditions (14.3%). Patients claimed that both inaccessibility and difficulty navigating the health system prevented them from seeking care earlier (5). Before meeting general practitioners at hospitals, patients are first referred from primary level clinics, which may contribute to the delay. But even at district hospitals, many of these patients fail to receive the appropriate procedures, since there are not enough general surgeons (1,5). In an analysis conducted specifically within 30 villages in rural north Rwanda, the prevalence of surgically treatable conditions was higher than other low-to-middle income countries. Within this population, over half of the patients had hernias or hydroceles, followed by around 44% with injuries and wounds that required surgical intervention. In addition, children under 5 were twice as likely to have surgical conditions, compared to adults in the area (4). Therefore, indicators for progress in more developed regions of Rwanda hide a large portion of the population that lives in rural areas, where poor resources, malnutrition, and inaccessibility lead to more severe surgical needs. 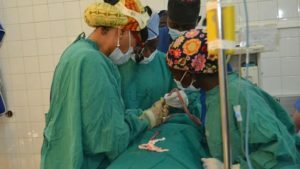 Despite higher rates of enrollment in medical education programs, Rwanda heavily relies on interventions from nonprofit organizations to take care of immediate surgical problems in disparate parts of the country (6).